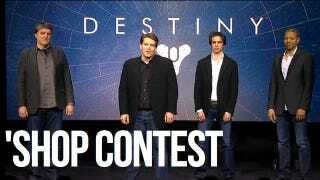 Before you climb all over Bungie's boy band for doing nothing and still looking ridiculous at the PS4 event, I want you to understand how damn hard it is get on stage and do nothing with your hands and not look ridiculous. This is why people still use handheld microphones or speak at lecterns they can grip. Or should. Otherwise, you look like a spelling bee contestant. OK, you understand now? Good. Let's climb all over them for looking ridiculous, in this week's 'Shop Contest! That's (from left) audio director Marty O'Donnell, Bungie president Harold Ryan, executive producer Jonty Barnes and head of corporate development Ondraus Jenkins. From more than 1,800 frames in Bungie's one-minute appearance at the PS4 event, I found the one with the highest combined derp quotient. I mean look at that. That thing tells a story. Mr. Ryan appears to be informing us of something mildly unfortunate, perhaps that the kitchen is now out of the hanger steak. Jonty looks like he's about to blink HELP ME in morse code to the camera. O'Donnell believes he has spied Ralph Macchio in the third row. And Ondraus—I lose it every time I get to him—has the look of a guy who spotted a rip in someone's pants, perhaps his boss's. That's my story, but I don't have to stick to it. Give me a better one. Let's get to the 'Shoppah! 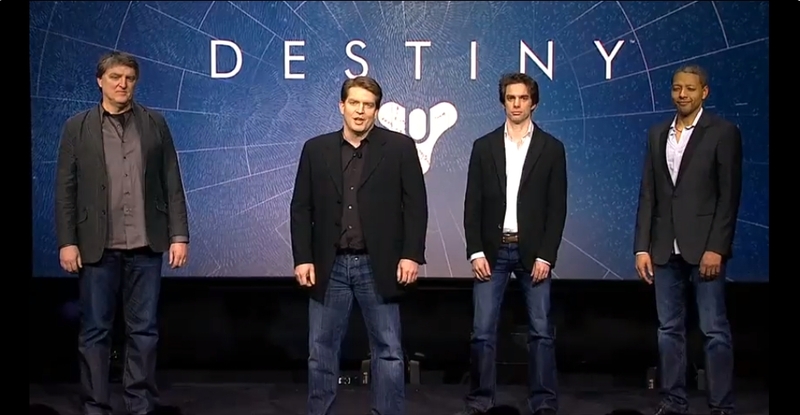 Source Image: Bungie's Boy Band. Here's everything else you need to know about posting 'Shops in the comments. All set? Great. Now, everyone, start your 'shopping!